New studies of the very distant universe confirm the idea that black holes and galaxies helped each other grow through massive mergers. In one investigation, researchers examined star-forming galaxies in the young universe and found that black holes appear to grow continuously during bursts of star birth. The observations reveal an intense round of star birth and black hole growth in several galaxies about 10 billion years ago. Astronomers think merging galaxies triggered the star formation while fueling the black hole growth. The work adds to mounting evidence for a cooperative construction project that left large, mature galaxies loaded with old stars and dominated by central black holes, as seen in the modern universe. 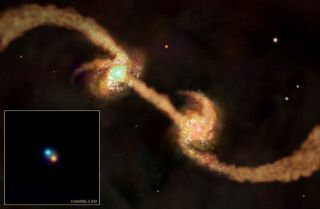 "These findings provide direct observational support for the simultaneous growth of large galaxies and their black holes," said study leader David Alexander of the University of Cambridge. The research is detailed in the April 7 issue of the journal Nature and was presented last week at a meeting of the Royal Astronomical Society. The galaxies were found with the James Clerk Maxwell submillimeter telescope. The Keck Observatory in Hawaii revealed the rate of star birth. Then NASA's Chandra X-ray Observatory was employed to detect the hot gas around the presumed black holes, which provided information about the growth rates of those central gravity wells. The glow near the black holes is thought to be gas that's in the process of being consumed and simultaneously lit up by the tremendous energy involved as it is accelerated to high speeds under the pull of the black hole's gravity. The findings fit with recent computer simulations, led by Tiziana Di Matteo of Carnegie Mellon University, suggesting galaxy mergers drive material toward the center of the merging system, providing food to the black hole. That simulation also suggested that the energy created when black holes merge contributes to star formation while blowing gas to the outskirts of a galaxy, creating a limit as to how much the black hole can consume. "These recent observations are in good agreement with our simulation," Di Matteo said. "It is exciting that we seem to be converging on a consistent picture of galaxy formation with both observations and theory." A separate inquiry using radio telescopes also found that galaxies prodigiously producing stars were often in the process of merging. "The more remote starburst galaxies, so called because of their high rate of star formation, typically produce 1,000 or more solar masses of stars per year -- at least 50 times more than the most active star-forming galaxies in the nearby universe," explained Anita Richards of the Jodrell Bank Observatory at the University of Manchester. The young galaxies in Richards' study also involved supermassive black holes being actively fed. "One clue to the origin of this phenomenon is that the Hubble Space Telescope often reveals two or more distorted galaxies associated with these sources," Richards said last week. "The ensuing collisions of gas and dust clouds trigger star formation and also feed the central black hole." Galactic mergers are less frequent nowadays. But in a few billion years, our own Milky Way will collide with the Andromeda Galaxy.